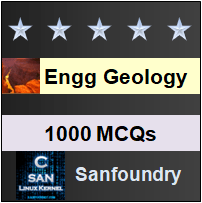 This set of Engineering Geology Multiple Choice Questions & Answers (MCQs) focuses on “Valleys”. Explanation: A valley, in the geomorphic sense, is a depression or hollow of considerable area extent surrounded on side by two or more elevated tracts. Valleys may be the result of age-long erosion along the medial parts of elevated tracts, or, these might have been produced from a gradual or abrupt subsidence. Explanation: The erosional valleys are the most common types of the valleys on the Earth. Erosional valleys may be the result of the stream erosion and the glacial erosion. They are accordingly named as River valleys and Glacial valleys. 3. The river valleys are typically of which shaped sections? Explanation: A river valley is the result of down-cutting and bank erosion by the river. Since most of the river erosion processes are concentrated along the bottom of a river channel, especially in the mountainous regions, the resulting river valley has a typical V-shaped cross-section. 4. What is the weathering of the exposed walls by physical and chemical processes followed by slippage of weathered products into river below under the action of gravity called? Explanation: Weathering of the exposed walls by physical and chemical processes followed by slippage of weathered products into river below under the action of gravity and rainwash, the process is called mass wasting. Explanation: Incision is the down-cutting along the base of the channel by the river itself and denudation is the modification of valley walls by undercutting, weathering and erosion. Explanation: Saw cut valleys arise when incision is the major process and denudation is either absent or negligible. A very narrow, almost vertical-walled valley is produced. Explanation: Exceptionally deep saw cut valleys with slightly opened up tops indicating some denudation are specially referred as Gorges. These are quite common and impressive features of the major Himalayas Rivers in their mountainous tracts. Explanation: Canyons are those types of gorges where the strata involved in down cutting is essentially horizontal or nearly so. The Grand Canyon of Colorado is a well-known example. 9. The valleys which are V-shaped are always symmetrical. State true or false. Explanation: The V-shaped valleys may be said to have established a broad equilibrium between the down cutting, slope-denudation and their load carrying capacity. The valleys may or may not be symmetrical in their transverse profile depending upon the type of rocks on the slopes. Explanation: In the formation of V-shaped valleys, the incision and denudation are approximately equal. In such cases, the valley profile assumes a typical V-shape. Explanation: When the incision becomes negligible and denudation of slopes is the major process, the result is a flat-floored valley. It is the common profile of a valley in the lower reaches of a river. 12. Depending upon the extent of incision and denudation occurred during the formation of a valley, how many broad classes of valleys are present? Explanation: The nature of valley profile at any section in the course of a river depends on the ratio Incision : Denudation operating in that section. Three broad cases may be considered. Saw cut valleys; V-shaped valleys and flat-floored valleys.